EFL Championship outfit Derby County have progressed to the fourth round of the Emirates FA Cup after they eliminated Southampton on penalties in a third round replay at St Mary's on Wednesday evening. The home team went 2-0 up thanks to goal from Stuart Armstrong and Nathan Redmond before Harry Wilson halved the deficit followed by an equaliser from Martyn Waghorn. 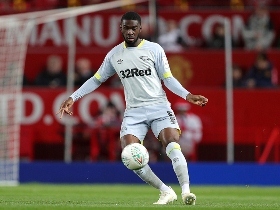 Fikayo Tomori was arguably The Rams best defensive player on parade and was solid throughout the game. The Chelsea loanee displayed his athleticism, was strong on the ball, showed great composure and offered good passes to his teammates. Apart from the two matches against Southampton, Tomori held his own against two other Premier League opponents in the shape of Manchester United and Chelsea in the League Cup. Having shown he has the makings of a Premier League player, Chelsea have a big decision to make in the summer, whether to retain him in the squad as a first-teamer or loan him out again to continue his development. An England U21 international, Tomori has started 24 of Derby's 27 matches in the Championship, scoring one goal.